Welcome to my newest series of guides! The links below will each bring you to a post with a series of maps and descriptions showing you the locations where the treasure chests spawn throughout the Pirate101 spiral! Each post will focus on one skyway, so there will be multiple posts for most (not all) worlds. I decided to start posting this series with the first two guides I have completed. This page will be updated with new links as I complete more guides. Hopefully I will be able to do at least one skyway per week, but as these guides take a long time to make, I can't make any promises. However, the newest guides will always be at the top of the list and marked as new. Further down the page, below the list of links, you will find more information and tips about using this set of guides. If you have any questions, please contact me and I will be happy to help you out. 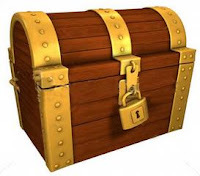 1) Not all locations marked on the maps will have a treasure chest in all realms. These just mark the locations where chests are known to spawn (or show up) at any given time. These guides are meant to help you know where to look while you are questing or if you're in need of gold. In most areas, only one or two chests per realm will be available at a time. 2) If you go inside a building/cave/dungeon in an area, the chest marked on the map will most likely always be there, regardless of how many you have found outside in that same area. 3) Treasure chests in higher up worlds have the potential to give you much more gold than chests in lower worlds. 4) All locations have a chance of spawning either a regular treasure chest or a 2-4 person group plunder chest. 5) I tried to make these guides as complete as possible, but there is always a chance I missed something. If you come across a treasure chest I don't have marked on one of my maps, please contact me with the information so I can add it and give you credit! Thank you for all your great work! Keep it up friend, I know that everyone is much appreciated for your contribution.